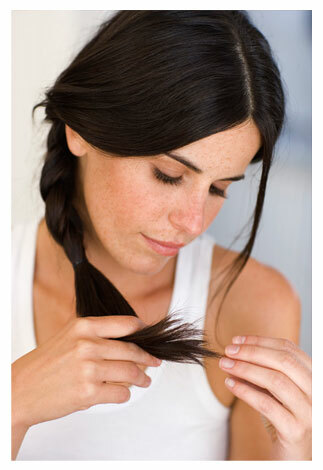 Constantly battling split ends and don’t know what to do? Though you may not want to hear it, you have to cut them off! Split ends left uncut will just keep splitting, and before you know it you will have a big mess on your hands. Once your ends are fresh, keep them stronger so you won’t have to deal with splits again, and your hair can grow longer and healthier than ever! – Waiting too long for a haircut. Generally speaking, you should be trimming your hair every 8-12 weeks. If your hair is weak, you may need to trim sooner, and if your hair is strong, you may be able to wait longer. If you flat iron or use a curling iron on your hair, chances are you deal with breakage and split ends. Reduce the use of these tools and save your hair big time. If you must use them, be sure to apply a heat protectant styling product first. If your body is lacking the nutrition it needs, your hair and everything else can suffer. Eating foods rich in Vitamin E, Iron, Omega-3’s, and Zinc are ideal for strong strands. I say it all the time, your hair products are the foundation to healthy hair, starting with a great shampoo and conditioner. If your hair needs more moisture, consider adding a hair mask to your weekly routine. Your hair will be very happy.